Wisconsin construction professionals have tabbed H.J. Martin and Son as their top choice in five industry categories, based on the 2018 reader rankings of The Daily Reporter. The company was voted as Best Carpenter, Best Commercial Cleaning/Restoration Company, Best Commercial Tile Company, Best Commercial Windows Company and Best Drywall Company in the state. The Daily Reporter covers the Wisconsin construction industry on a statewide basis. It has a daily print readership of 6,000 industry leaders and decision-makers. For the second straight year, the publication surveyed its readers to get their opinions on subcontractors and suppliers in over 90 categories. H.J. Martin and Son emerged as the preferred vendor in the five categories mentioned above. It also was voted No. 2 in the Best Materials Supplier category and received honorable mention for Best Commercial Flooring Company. H.J. Martin and Son features highly experienced teams which self-perform work in all of the honored categories. The Walls & Ceilings (aka Drywall) division alone has more than 180 collective years of experience. H.J. 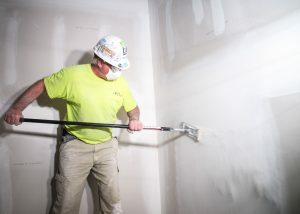 Martin was chosen as Best Drywall Company. The company’s Glass & Glazing division also has been named a ‘Top 50 Glazier’ by Glass Magazine each of the past three years. The Commercial Flooring division offers a wide variety of commercial tile and other flooring solutions for corporate and retail projects. A rapidly emerging service of H.J. Martin and Son is commercial cleaning and restoration. Trained technicians paired with the latest technology result in a successful client experience. The company provides Carpentry work on a wide variety of projects. These range from Commercial Millwork installation to casework installation as part of its National Retail Solutions. H.J. Martin and Son was named Best Flooring/Tile Company and Best Drywall Company last year in the publication’s inaugural reader rankings.